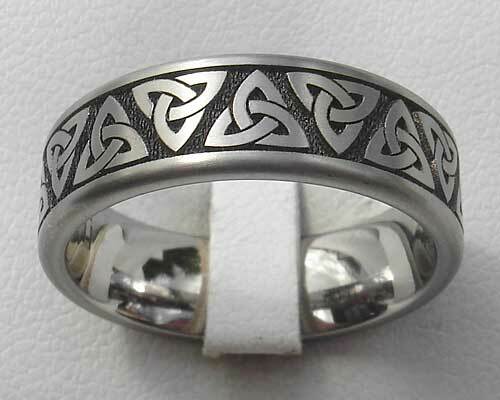 Titanium Celtic Trinity Knot Ring : LOVE2HAVE in the UK! A titanium ring reversed engraved with the familiar Celtic Trinity knot pattern that repeats around its outer all the way around. The ring is flat in profile with two outer rails and chamfered edging. We feature the polished version here as we think the bold Trinity knots look simply stunning in this finish, but you can have satin if you wish. This version is the most daring of all the Trinity knot designs we sell and is also available in a domed shoulder cut profile in this section too. Being made from titanium this ring is very sturdy when it comes to scratch resistance against everyday wear and tear, however, please note that all metals do scratch, but titanium far less so than silver or gold. 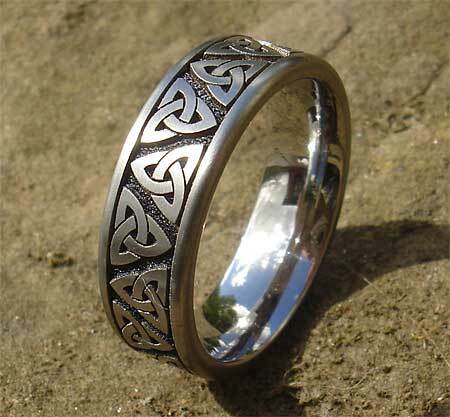 Our Celtic titanium rings, therefore, offer more exceptional value for money over gold. The designer has advised us that the engraving for this ring takes an hour to complete. The engraved surface itself is quite textured, therefore adding to the ancient Celtic symbolism depicted. The ring's width is 7mm, and as mentioned above it is available in a satin or polished finish.